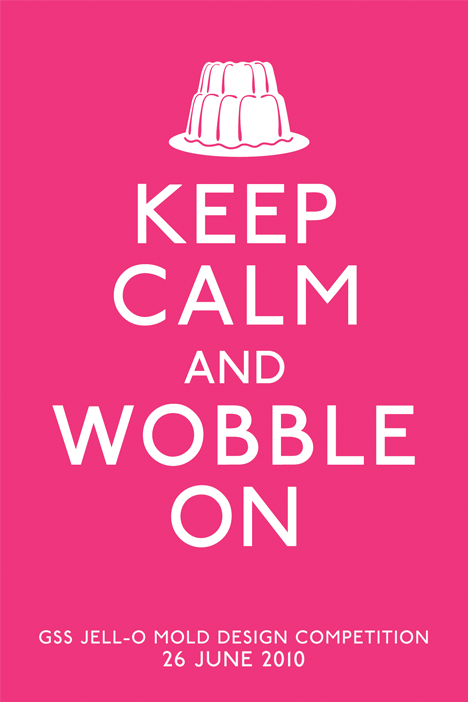 Keep Calm and Wobble On. The Gowanus Studio Space Jell-O Mold Competition is back for a second year . . . because frankly, Jell-O hasn’t gone anywhere. It wobbles onward, come what may. Jell-O springs eternal. This year’s competition asks designers to explore the resilient properties of Jell-O as a design medium, a cultural phenomenon, and food that just won’t quit. Designers will compete for cash prizes, a feature on Make: Online and CRAFT websites, and more! Jell-OH! Lecture Series and After-Party TBD, so stay tuned! A crack panel of respected judges including Allan Chochinov of Core77, Becky Stern of MAKE and CRAFT zine, food-design strategist Elizabeth Jones, and conceptual designer Harry Allen, will announce the winners at 8pm on Saturday, 26 June 2010. Thu Tran of Food Party will host. The judging and awards ceremony will be held at the Gowanus Studio Space in Brooklyn.